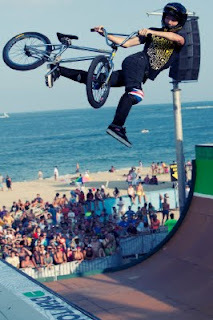 Today in Ocean City, Maryland for Dew Tour stop 1, Vert Prelims got under way. Twelve riders were cut to six for tomorrows final. Vans Pro Simon Tabron was on point today and finished in the top spot. Simon can allyoop 540 so good! Coco Zurita blasted to the moon and finished 5th, and DMC put a couple great runs together and finished 7th. DMC will miss the finals, but was happy with his riding today non the less. Good luck Coco and Simon!